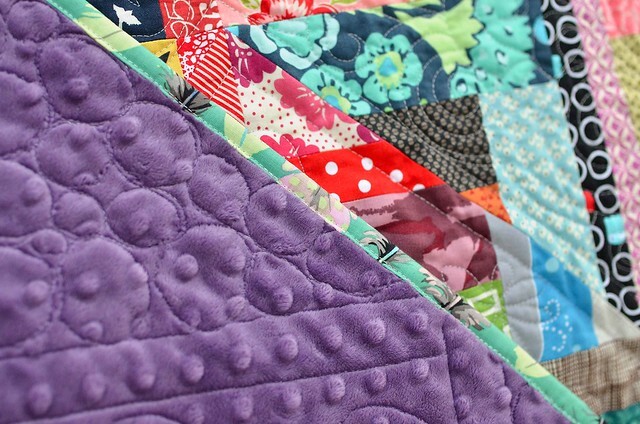 I need to make some scrap quilts this year and my sisters have each put dibs on one. But before I get that started, I wanted to make a warm and snuggly quilt for my Mom. One of the first quilts that I ever made was for my Mom but since the quilts I have made for my sisters are a little more fun that the one that I made for her (see here, here, and here) I thought she needed a new one first. A while back I pinned this quilt on Flickr (Lindsey actually just posted a tutorial on how to make it) and when I was looking for a scrap quilt idea, I knew this was the one. I wasn't sure how she put hers together at the time, but I made mine pretty much the same way except I used a 16" square in square shape and then made my half square triangles like this. I also arranged mine in zig zags instead of diamonds. My sisters all requested non-bright, non-pink quilts so I knew that this quilt needed to use a bunch of my bright scraps (hope that was okay Mom!). The minky made the quilt too heavy to pin up and my helper has been working a zillion hours a week lately so I had to settle for hanging the quilt over the top of the railing. Recently my Mom has lost a lot of weight and she told me that she is always cold so I wanted to use a warm backing. I went with purple minky dimple dot. I even used some precious Martha Negley feathers for the binding. I sewed the binding down with my machine for this quilt since this was for my mother and I figured I could use hers as a guinea pig. While it was faster than hand sewing the binding, it was also more stressful and all around more awful. The end product was okay, but I did have to go back and fix a few spots and I think I will be sticking with hand sewing the binding in the future. I mailed it on Friday and it should be waiting for her today when she gets home from work. Surprise Mom! update: Since I have had a couple questions about working with minky backing, here are some thoughts/tips in a previous post. LOVE the colors and the intricate piecing pattern. Does your brain ever rebel looking at all those turns and angles? Mine would! I love how the zig zag is there but only kind of. It's like high volume colors but low volume contrast, if that makes sense. This is gorgeous! I am in awe of the detailed quilting on minky! Did you use batting as well? How did the minky react to the FMQ? Gorgeous! You have one lucky mama! I love the sister quilts you linked to also, you have wonderful color sense. I feel you on the machine sewn binding. It's literally hit and miss sewing blind. Beautiful! 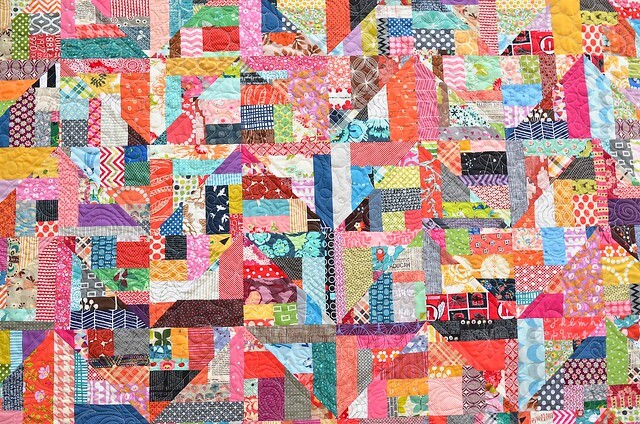 Gotta love a good scrap quilt! Love it!! And I LOVE the minky backing! Was it hard to work with? and did you still use batting in between? oh! this is fun! i bet she loves it. gorgeous quilt, Erica. I love all the pretty bright scraps and that minky backing is perfect. Lovely quilting, too. That is such a great way to use your bright scraps - looks great! As for the binding, I felt that way when I first started machine sewing the binding but it gets better with practice so I wouldn't completely give up on it yet! WOW! It is brilliant in the zigzag pattern, such a gorgeous quilt. I bet she loves it. I've only machine sewed one quilt and it was a disaster. I know no one looks at the back up close but it drove me bonkers that the stitching on the back wasnt would go off the binding and onto the backing all crazy even though it was straight on the front. It turned out beautiful! I love the layout and the quilting. I totally want to make one with my scraps now, what a great way to use them up. Gorgeous! What a great surprise for your mum :) I'm totally with you on machine binding, it's a nightmare and I much prefer doing it by hand. Absolutely stunning. I love the complexity of the zig-zag design and scraps. So awesome! It looks wonderful! I'm sure your mom will love it! Gorgeous quilting on this baby. I love how riotous the colours are and how well they all work together. It's beautiful! I love the bright colors and minky back. Your mom is lucky and hopefully nice and warm now! This looks great. A lot of movement. Love the quilt top! Scraps are so fun to work with! What an awesome surprise. I'm sure she's going to love it!!! I totally here you on the "awful" and stressful feeling of your first try at machine binding. With the straight stitch like that I truly dreaded binding. It WAS awful. I'm sure your hand sewn bindings are gorgeous! 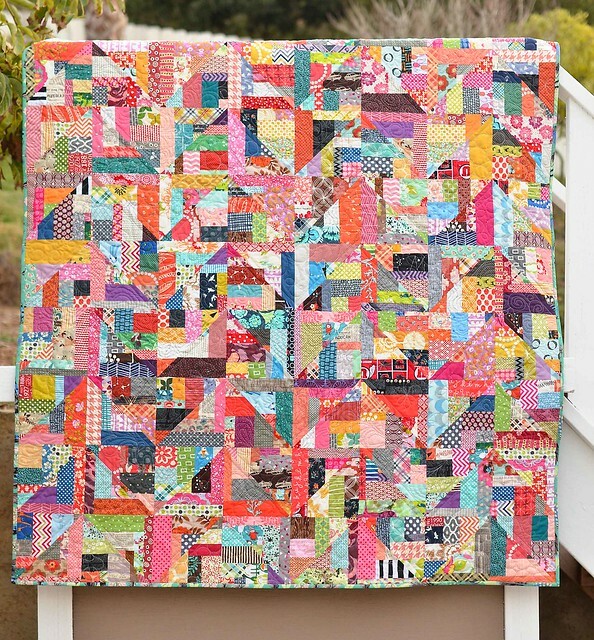 This is just gorgeous... one of the prettiest scrappy quilts I've seen in awhile! I love how you quilted it too. Don't give up on machine binding... with a little practice it can look great! Looks great, love the zig zaggy layout. Wonderful subtle zig zags! It is so gorgeously scrappy! I absolutely LOVE this quilt. It is so bright and happy, and the design is so unique. I am definitely checking it out! What a fun quilt....your mom will love it! Love the zig zag pattern! What a great and thoughtful quilt! Your Mom will love it. Machine sewing on binding is stressful - must have been more so with Minky! Oh how wonderful for your mama!! 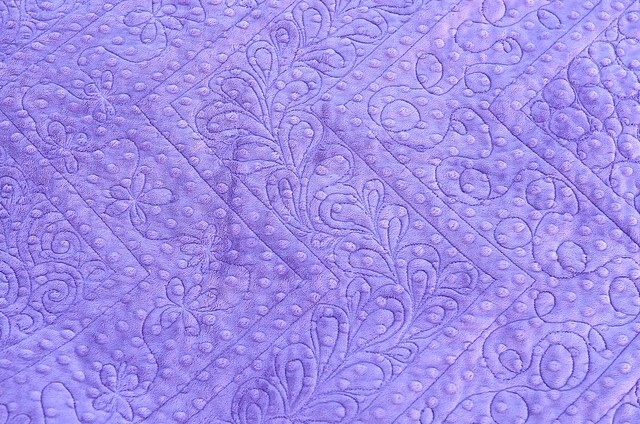 The backing is soooo pretty with the quilting!